BANGI 12 Dec 2013 – Asians need to revise their own history, one that is free from western influence and not just include the official version by those in authority, said a Thai historian. Prof Dr. Thanet Aphornsuvan, a professor at the Thammasat University made the remarks at the Malaysia and Thailand Roundtable discussion here today in The National University of Malaysia (UKM). He is famous for his work titled Rebellion in southern Thailand: Contending Histories. The roundtable discussion was organized by UKM’s Institute of Malaysian and International Studies (IKMAS). Prof Thanet said sometimes, history has an official version that seems to suppress other narratives which are deemed unfavourable. He gave an example of how the southern Malay Muslims are labeled as ‘Separatists’. He explained that they are actually a people who want to be governed by leaders of their own choice. They have their own way of handling problems that arise like their own legal system. In other words they are just normal people who contributed to the nation but the only problem is they began boycotting elections. This is seen as a threat, and the problem starts from there. He said that countries in the region need to allow other contending version of history to exist. However the Thai Ambassador to Malaysia Krit Kraichitti who is also a panel member, disagreed. He said allowing too many versions of history would lead to chaos and anarchy. Then different ethnic groups would make claims on the country, despite having ruled a province 500 years ago. He agreed on one thing, however, that history needs to be rewritten but nothing can be done about past. “The past is gone, but we can do something about now, which is going to be history in the future. If we still hold grudges because of our past history then our future history will be the same. Present conflicts will go on to be tomorrow’s history,” He remarked. But if we just take what is good in our history and forge relationships then we will have a peaceful history. 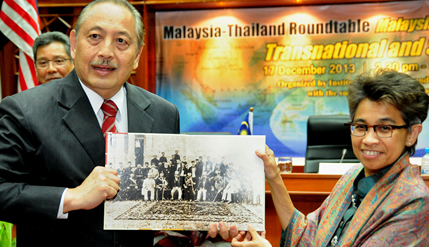 The other panel member was Dato’ Syed Ariff Fazillah bin Syed Awalluddin, President of Malaysia-Thai Association. He was the most diplomatic of them all, giving a historical account of Malaysia and Thailand relationship. Another panelist was Prof Dr. Kobkua Suwannathat Pian a Professor with The Sultan Idris University of Education, who shed some positive light. But many now realized our history is virtually a version we inherited from the British. She added things are changing now and a more accurate version of Malaysian history is in the making. The roundtable, talk was the first of many series to come. Some in the audience were disappointed because pressing issues like the Patani Muslims was not discussed. Present at the discussion was the Ambassador of Ecuador Her Excellency Lourdes Puma Puma, Prof Rashila Ramli, students and members of the public.